Two very busy final days with Dronfield. My first group, Dronfield Explorers, left this morning, their last few days were busy and very eventful. Wednesday night’s BBQ was a great success and resulted in some very tired explorers and leaders the next morning for a trip to Brussels. 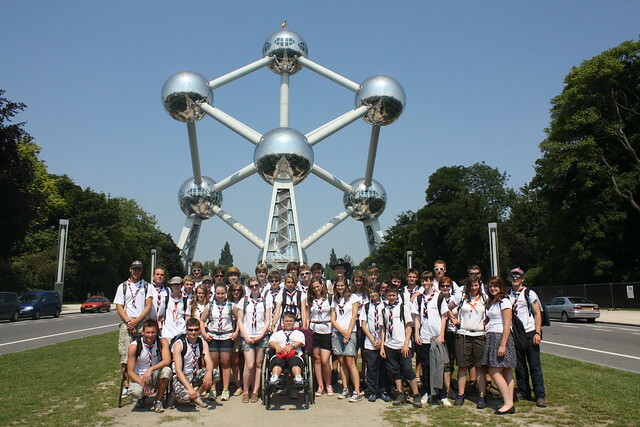 The groups took the city sightseeing bus tour, stopping off at the Atomium and taking a look around the different exhibitions inside. After hopping back on the bus and returning to the centre of Brussels the kids were let loose for a few hours before meeting back together for dinner at Friteland where they stuffed themselves on giant burgers complete with chips in the bun. A small street show was going on opposite the restaurant with some local juggling, although Emily showed them up with her juggling skills! After a long day and a long train journey back I think the kids went straight to bed. The final day was spent at Walibi theme park and Aqualibi, the water park. Both explorers and leaders had great fun on the roller coasters, some of them came off a little light headed and queasy, but otherwise fine. The water park was even better, everyone had a go on the flumes and then the whole group circled the rapids till we left. I think the life guards were near ready to chuck us out after almost 40 scouts went down the rapids in one group. The day was completed with dinner at the local bar in Sint Joris Weert. The best day of the week I think? This morning consisted of some haphazard last minute packing for the explorers and final farewells from myself to the first group. I have now welcomed 9th Airdale Scouts and Explorers from Leeds onto the site, who I’m sure will have a similar action packed week. A final thank you to the 7th Dronfield Explorers who made my first week as a Venture Abroad rep very memorable indeed!